We are at a bizarre stage in history when the words and actions of a Catholic Pope are part of an article on climate change: When 190 world leaders brag about an agreement to spend trillions of dollars on a completely non-existent problem and the Pope supports them: When the Pope suggests Catholics have fewer children: When the Pope hints at advocating Birth Control: When a group of educated people recommend getting rid of all the people on Earth. 2. This sister (Mother Earth) now cries out to us because of the harm we have inflicted on her by our irresponsible use and abuse of the goods with which God has endowed her. We have come to see ourselves as her lords and masters, entitled to plunder her at will. The violence present in our hearts, wounded by sin, is also reflected in the symptoms of sickness evident in the soil, in the water, in the air and in all forms of life. This is why the earth herself, burdened and laid waste, is among the most abandoned and maltreated of our poor; she “groans in travail” (Rom 8:22). We have forgotten that we ourselves are dust of the earth (cf. Gen 2:7); our very bodies are made up of her elements, we breathe her air and we receive life and refreshment from her waters. the doctrine that God is the transcendent reality of which the material universe and human beings are only manifestations: it involves a denial of God’s personality and expresses a tendency to identify God and nature. The irony that is lost on environmentalists and advocates against global warming is that if overpopulation is the real problem then according to Schellenhuber global warming offers a solution. The same argument holds for Malthusian population controls, such as disease, wars, and famine. If overpopulation is THE problem then why stop these natural controls? Pope Francis aligned himself with Schellnhuber and the IPCC in Paris apparently not realizing they are neo-Malthusian’s. That is they think we must limit population and development because we are using up all resources at an unsustainable rate. This created a moral and philosophical dilemma for Francis amusingly noted by the National Catholic Reporter. Pope Francis said Pope Paul VI, whose 1968 encyclical Humanae Vitae outlined the contraceptive ban, was warning against a “Neo-Malthusianism, ” a reference to a theories that suggested in the 1960s and ’70s that exponential global population growth would lead to an irreversible world food crisis. While in flight, returning home from the Philippines capital, Manila, on Monday, Pope Francis had some plain words for Catholics about family planning. The church’s ban on contraception doesn’t mean Catholics should breed “like rabbits,” the pontiff said during an hour-long news conference. What the Pope clearly doesn’t understand, or possibly, want to understand, is the real objective of the group he partners with, known as the Club of Rome in the battle against global warming is to reduce the population. The relationship between population and resources is an issue throughout history. Confucius (551 – 479 BC) discussed the relationship when he talked about carrying capacity, a phrase now used mostly in agriculture. In the 19th century Thomas Malthus claimed the population would outgrow the food supply. Charles Darwin took his book Essay on Population with him on the Beagle and said it was the major influence on his theory. The current alarmism over population growth was a key piece of the ideas of the Club of Rome and their now discredited book “Limits to Growth”, which combined with Paul Ehrlich’s book, “The Population Bomb.” The ideas combined at the 1994 world conference on population in Cairo, where Al Gore led the US delegation and gave the keynote speech. Here is the philosophy from Section 3.1 of the material used to justify the conference. There is also general agreement that unsustainable consumption and production patterns are contributing to the unsustainable use of natural resources and environmental degradation as well as to the reinforcement of social inequities and of poverty with the above- mentioned consequences for demographic parameters. All the population predictions throughout history were wrong. By any measure the world is not overpopulated. At the Conference, the finger was pointed at African and Asian nations as poor because they were overpopulated. This ignores the fact that the Netherlands is the most densely populated country but is also one of the wealthiest. What contract did we quit? Who did we make it with? In his arrogance and narrowness, Graber does not consider a virus that wipes out Graber and his friends. Christopher Manes author of “Green Rage” is similarly arrogant because he considers that “a large percentage of humanity is (an) ecological redundancy.” Manes, at least, considers a few are worth saving. David Foreman former chief lobbyist for the Wilderness Society doesn’t agree. He considers the optimum human population number is zero. Prince Philip, like Schellnhuber, sees a value in diseases and virus. He said he would like to be reincarnated as a deadly virus to reduce world population. I would not object if the virus started with the people in the monarchy. Canadian David Suzuki, a former genetics professor, might see the irony although I doubt it. He said. First, he is wrong because all other species do put a value on everything else – it is food, or it is not food. Assigning value doesn’t get more basic than that. Second, the 30 million number is pure speculation, but so are the statistics Suzuki uses about the rate of extinctions and most other issues. 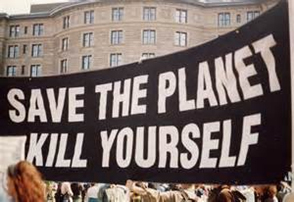 Arne Naess, Norwegian Eco-philosopher and Ecologist says the “optimum human population of earth” is 100 million, so approximately 6.9 billion of us have to kill ourselves to save the planet. I struggled for years with the role or function of extremists in society. I realize now their job is to define the limits of an idea or ideology. Most people are environmentalists, and should resent those who have usurped the concept or the title. A few, like David Suzuki, Al Gore, and now Pope Francis, grabbed the idea and from the moral high ground it provided, lorded it over the majority. The truth is they didn’t care about the environment; it was just a vehicle for their political agenda of total control. 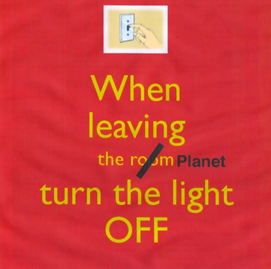 Everyone cares about the environment; the question is how far do we pursue the concept. Those who are anti-humanity and anti-society, or don’t believe evolution applies to humans, have the ultimate in arrogance. Is there any other species that would advocate its own demise? However, in doing so, they define the limits of environmentalism for the majority and their world recognizes that humans and their activities are as legitimate as those of any other species.